Can we avoid the input cap ? If you use batteries or an isolated power supply, yes. But I'd like to know exactly what kind of power supply and situation you have before I create a bunch of useless schematics. Yes, I eventually chose the inductor because it did not cause distortion or impair sonic focus. I actually posted that old schematic by accident, because I thought it was the Kuartlotron's fault that Joachim's setup was ringing. Actually it was the output cable resonating in it's series mode, causing that telltale cusped rising square wave edge. The Kuartlotron may be fine without the inductor as long as you have the 47R output resistor, which is basically what Dan's using. LTSpice does funny things if you use the M suffix. In LTspice use MEG for M(megaohm). Whether this would be stable etc in Reality ? Even if it's OTT for audio, it "might" be a useful technique for video ? I am planning to use the Kuartlotron just after a jfet common source high gain amp stage. 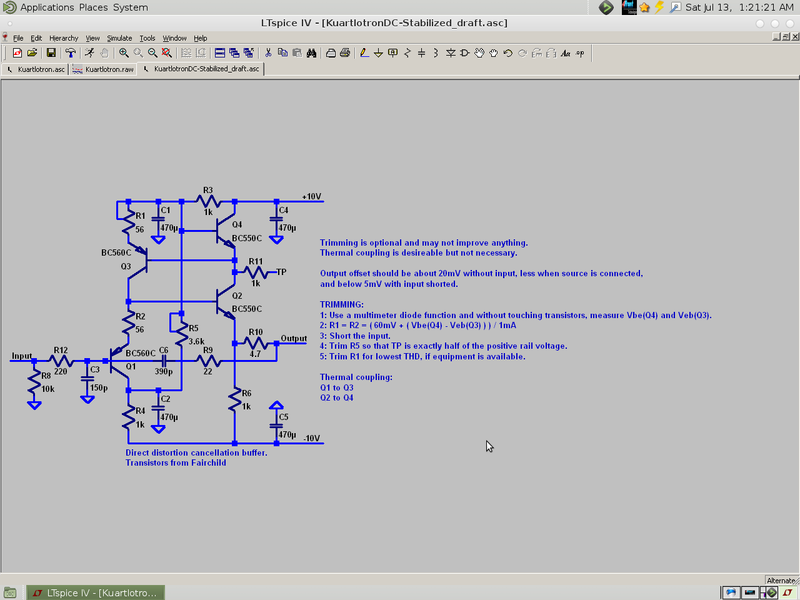 It outputs 10v DC offset modulated by signal. Maybe I can build the stock buffer with simetrical psu (so I will loose output cap) but would like to increase it's input impedance to 1mega so I can use a small cap in the input. just give you a picture of my working place and a "certain "
The sound has a level of undisturbed, clear information, that is only mached by the very best line stages I came accross in my "Audio Life"
Do you use the buffer just to drive long cables ? Her system is so high gain that we use the buffer as the line stage. There is a 10kOhm TKD pot before that regulates the volume. Actually we made several buffer shoutouts that way. That included the Piglets Dad, the Hawsford, the Calvin, the Paradise and another buffer designed by me. I study buffers since many years because i found they have a profund impact on the sound also from the technical data that should not be the case. Here is a better picture of the buffer with volume control i have build. Kean, congratulations for your "philosophical buffer" circuit.